The table below lists all make-ups available in the beauty salons. Some make-ups are only available during Halloween. Enjoy yourself browsing and selecting. Abbie Starwatcher. Many thanks to Kathrin Shortnight who took the pictures and collected all information. Use the dropdown selectors below to filter the table in order to display only matching make-ups. 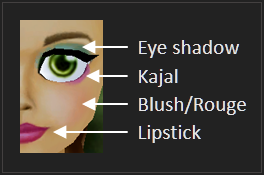 To select colors for eye shadow, kajal, and lipstick you can use the color boxes. Additionally, you can look for special features like Smokey Eyes, blush (rouge) and other (mole, star, halloween). And as usual, the field on the top right of the table allows to search for any text in the table. No responsibility is taken for correctness, completeness, and currentness of data! PLEASE NOTE: this is a private website, I have no business relationship with SSO!